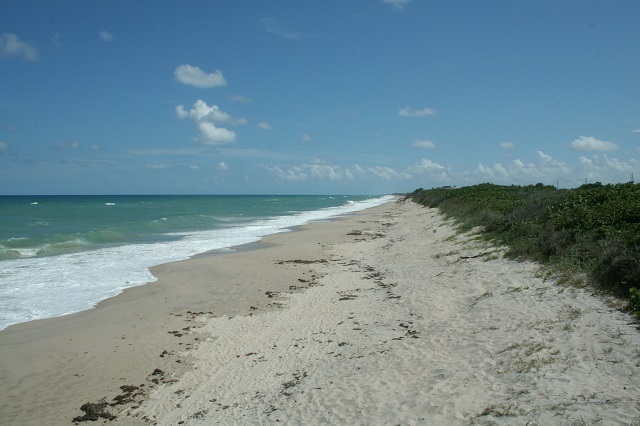 Located within the Archie Carr National Wildlife Refuge complex, Coconut Point Park (not to be confused with Coconut Point Sanctuary located south of this site) warrants a stop if you are passing through the Melbourne area. The primary habitats here are beach/dune and coastal strand. Check for shorebirds on the beach such as Black-bellied Plovers, Ruddy Turnstone, Sanderling and Red Knots in fall and winter, and scan for Northern Gannets, Bonaparte’s Gulls and Great Black-backed Gulls feeding close to and/or on the beach. From late summer through winter look for fishing boats passing by and the flocks of gulls and terns that follow them; these flocks often attract the attention of Magnificent Frigatebirds, and Parasitic and Pomarine Jaegers who are looking to steal a meal. Watch the surf for Common Loons and Lesser Scaup in winter. Sea turtles nest here from spring to fall. One of the two dune crossovers is wheelchair accessible.